ECM records prove that time and time again they have some really creative artists in their catalogue and as a result, their albums are always intriguing and seldom, if ever, disappointing. 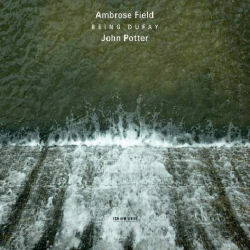 This new release from Ambrose Field and John Potter is no exception; it is part of a fascinating project which takes fragments of late mediaeval music and uses them to present 'Guillaume Dufay in the present tense' as Field puts it. The project originally started life as a commission from a festival in the Italian town of Vigevano (near Milan) and following that success has grown, over some three years, into the seven linked pieces on this album. The artists are in interesting pairing. John Potter was, for seventeen years, a member of the Hilliard Ensemble and sung on the majority of their albums including the famous ones with Jan Garbarek (another ECM triumph) and now combines his solo career with academic work – he is an important authority on the history of vocal production. Ambrose Field is an award-winning composer who specializes in digital techniques and computer processes which draw on environmental sound sources, and, in this instance, a digital map of Potter's voice. The result of their work is a rich series of soundscapes which have been set to a backdrop by the video artist Mick Lynch. Some of this live version can be seen on YouTube (search for 'Being Dufay') but the audio experience of this album stands alone perfectly well. Fragments of Dufay's work run throughout the album in various guises. In the first work, 'Ma belle dame souveraine', Potter's vocals float on a minimalist ribbon of music, the result is a wistful sound world which Field describes as 'a picture of resonances, hanging in the empty air of a great cathedral…' and indeed, for me it is that sense of huge spaces that pervades all seven pieces and binds them together. More obvious electronic intervention characterizes 'Je me complains' in which the full power of the digital Potter is unleashed towards the end when it 'explodes into full audio technicolor'. The labyrinthine qualities of Italian castles and Dufay's musical technique combine over the next two tracks 'Being Dufay' and 'Je vous pri' until there is a reflective pause in the form of an electronic intermission 'Presque quelque chose' after which the vocal processing in Sanctus is turned up several notches and the album finally finishes with the melancholic 'La dolce vista'. The listener can choose to be guided, as I have, by Field's brief but enlightening liner notes or can just let their listening experience take its natural course. These works are often as intricate as Dufay's compositional technique, borrowing and reworking from the musical fragments, from Potter's voice and from nature. Thankfully, Field steers clear of loud aggressive electronic sounds so the net result is a deeply reflective (possible introspective? ), fond memory of Dufay which merges into the modern landscape. Time also plays an important role, the transcendence of the age of Dufay –as he steps into the present, and the timing of the vocal fragments, never hurried, never over-repeated. This latter point is illustrated in the touching way Dufay's biography sits alongside Field and Potter in the booklet as if his involvement were contemporary. There is a pleasing sense of irony in these works; Dufay the great borrower of other people's music is himself borrowed and the great user of the cantus firmus becomes the cantus firmus for someone else's composition. This is not the future for early music, and they don't try to claim that – but it is a future and one which deserves investigation with this kind of integrity. It offers beautiful and thought-provoking sound-scapes and I hope that the live performances start cropping up at more and more festivals in the near future.